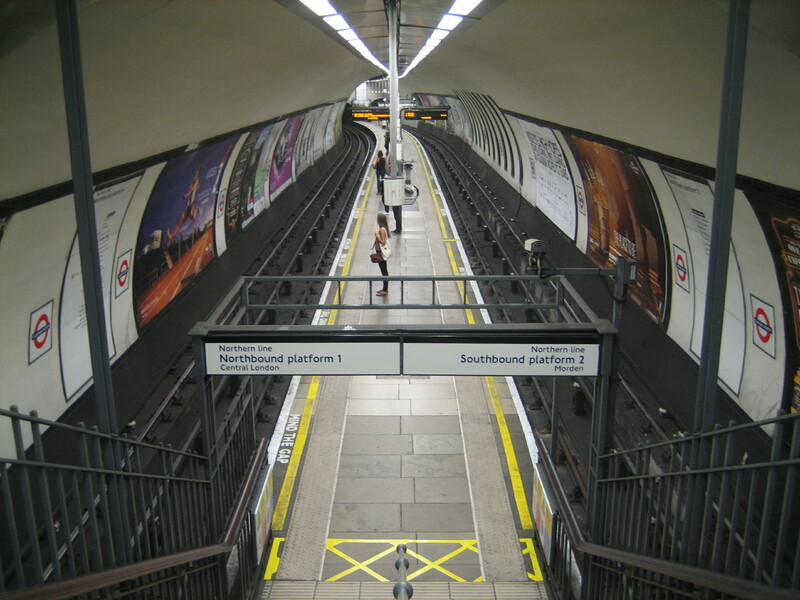 There are only two stations deep below ground with platforms like these: this one, and the next stop south on the Northern line, Clapham Common. I don’t claim greatness for these platforms on safety or accessibility grounds (though I’d be interested to compare the number of accidents per year at Clapham North with those at recently refurbished deep-level Northern line stations, like Angel or Mornington Crescent). What makes them special is their rarity and their antiquity. Not everything that is old is worth preserving, just as not everything that is new is transient. By and large, the “right” bits of the 150-year-old Underground have been kept and restored, while the “wrong” bits are – after a long wait – being sorted out. But the platforms here and at Clapham Common cannot be sorted out, because there isn’t room. A whole new tunnel would have to be dug. That isn’t going to happen any time soon. Using these platforms is therefore something of a novelty yet also, in an odd way, a sort of privilege. Passengers aren’t treated like fools at Clapham North. We are trusted to use this eccentric (to our eyes) architectural arrangement, and not to blunder dopily on to one or other set of tracks while reading a newspaper or prodding at our phone. For the occasional visitor there is also excitement to be felt when trains rush in from either direction simultaneously: a sensation compounded by being in a single contained space. The platforms are islands of history, not just of convenience. They can’t be allowed to exist forever, and they shouldn’t. But for now, their latterday idiosyncracy renders them teasingly special. Angel certainly had an island platform before it was rebuilt, but I don’t think Mornington Crescent ever did. It’s long closure in the 1990s was for other reasons. There are of course other island platforms on the underground, not least on the outer reaches of the Edgware branch, including the recently featured Brent Cross. They tend to be wider, of course, but I wonder whether the feeling of oddity a the Clapham stations comes from their underground unexptectedness as much as from their narrowness. 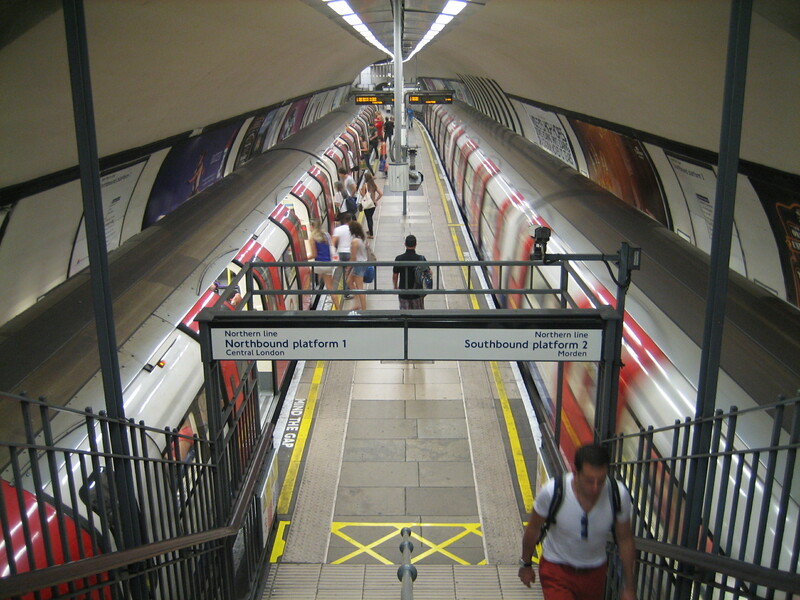 I picked Angel and Mornington Crescent because they’ve both been done up fairly recently, and hence are examples of “new-ish” Northern line stations, compared with the very old Clapham North. You’re right, there are other island platforms on the network, but they’re all above ground. The Clapham ones are the only below-ground examples remaining! Funnily enough I was at Clapham Common yesterday (Saturday). It certainly feels a little bit alarming when there are trains arriving in both directions and the platform is so narrow. When the platforms are busy it is a bit worse. I often go through both stations in the morning peak. Clapham Common in particular gets really busy. I’ve only caught a train at a peak time there a couple of times and it’s not something I’ve particularly enjoyed. Interesting from a historical experience and scarily expensive to do anything about. I should say too how much I’m enjoying this blog. A lovely mix of places I know, but haven’t fully appreciated, and places I didn’t know at all. I had never ocurred to me that Arnos Grove could be such a fine place. I’ve not been to the Claphams, but the Glasgow Subway has a similar dizzying effect when there are trains moving through. It’s a bit like being stuck in a vortex. Hello, I just wanted to say that I’m really enjoying your blog. It’s nice to think that someone else looks at all of the Underground’s idiosyncrasies and oddities with affection too. Technically isn’t North Greenwich on the Jubilee extension an underground island platform, albeit a very large one? I think some places on the District line [Mansion House, Mile End] have them too…. Otherwise, great blog and interesting post. I’ve always been somewhat alarmed by how insecure one feels on the platforms at these two stations. Very much of their time really, something very 1930s about the idea of having an underground island platform. Interesting about Angel tube being rebuilt to get rid of the island platform, I take it that’s why one platform there is absolutely huge and the other [the newer bore presumably] is more standard size? Same with one of the Northern Line branches at Euston. Actually, may I make a suggestion that an entry to this blog, if it’s not been done already, should be about those unnaturally large platforms? I always like them, they feel much more calming to sit on. I kind of wish it was possible to rebuild the whole Tube network that way to make all the platforms that size, but logistically and financially it would be a huge task. Also, I think Farringdon station deserves a mention because it feels quite unique with Underground and heavy rail coexisting. Maybe also the Metropolitan line past Wembley/Neasden because it has the feel of being a proper ‘main line’ [which indeed it was, as it shared space with the Great Central and was part of Watkins’s vision for a Manchester-France route] rather than a regular suburban line. Really enjoying this blog, keep at it. All the Holden architecture amazes me, must see more of that when I get the time. Thanks SD, and great idea about the platforms at Angel. I’ll add that to the list! You’re right that some of the District line stations have island platforms, but I’m going to be fussy and say they don’t count because they’re sub-surface ones. 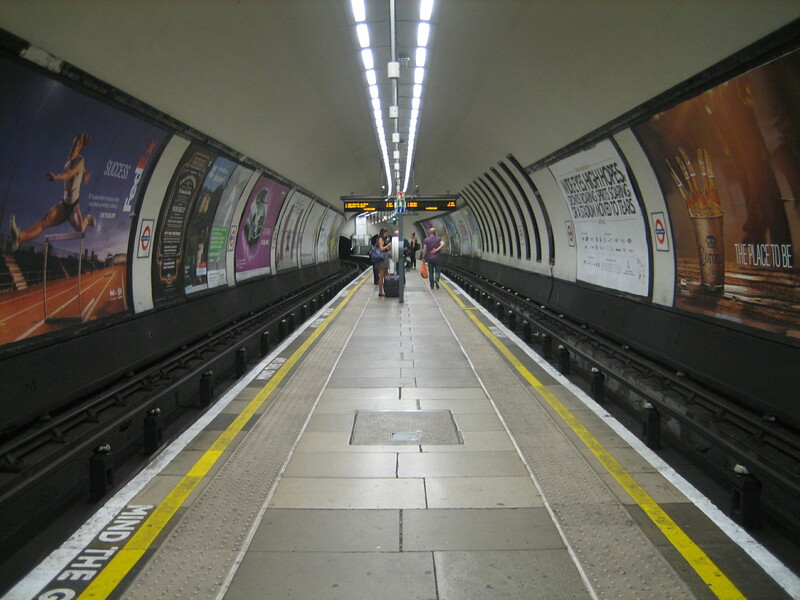 The two Claphams are the only deep-level stations to have this kind of arrangement. North Greenwich is really a giant cavern rather than a single tunnel split down the middle! Ah I see what you mean. Yes I agree that the Clapham platforms aren’t like anything else on the network in that regard. Thanks for taking my idea on board 🙂 There are probably 15,000 great things to point out about the Underground, never mind 150! One of my personal favourites is the little display kept at Barbican station on the wall next to the ticket barriers of old photos of the station and its history. I am so glad I found this blog! I am a half-english (thanks Mum) Aussie ex-pat living here, and just the last few months have really lost my love of London – to the point of questioning being here at all. You have just restored some of the love. Your enthusiasm for the tube, and the positive way you present it reminds me of the joy I had in those first few years here. THANK YOU! And I’m off to visit that wooden escalator tomorrow – just for fun! Thanks Jane. Hope you enjoy what you find! Beautifully written! You have such a lovely writing style. I blog about trains/tubes.. But for a completley different reason! I used to use Clapham Common Station on visits to nearby (now defunct) indie record shop Zippo back in the 80’s and bumped into American singer/songwriter Ted Hawkins on the platform. The narrowness of the platform always freaked me out. Now I know about the history of the City and South London Railway, I’m tempted to pay another visit. P.S. The blog is brilliant – hope you don’t stop when you get to 150.